Activists and civil liberties lawyers have condemned the harsh bail conditions used to restrict the movements and communication of Rockhampton Peace Convergence activists protesting the Talisman Sabre military exercises. Sixteen people have been arrested demonstrating against the joint US-Australian military training exercises and all of them have been offered bail conditions which not only prohibited them from going within 100 metres of any military facility, but also included a list of community spaces they weren’t allowed to attend and a list of protesters they weren’t allowed to associate with. Most of the protesters refused to sign the conditions and pled guilty before a magistrate. Jim Dowling from the Brisbane Catholic Workers refused the conditions and has been locked in the Capricornia Correctional Centre awaiting mediation for trial next month. Andy Paine, also from Brisbane, signed bail after having a magistrate reject a request for the conditions to be dropped. Michael Cope, lawyer and president of the Queensland Council of Civil Liberties, agreed that the conditions were inappropriate. Mr Paine said “I am very concerned that police are able to unlawfully silence dissent by giving bail conditions which stop people participating in democratic protest activities. Two years ago at Talisman Sabre, we were given similar bail conditions only for the charges to be subsequently dropped. “Peace Pilgrims” Sam Quinlan, AJ Van Tonder and Teigan Evans faced the Magistrate’s Court today after a night in the watchhouse, receiving fines of $500 each. “A fine is a small thing to risk compared to the violence our wars inflict on others” said Sam in court. The three were found and arrested yesterday after a couple of days walking through the area. The trio are part of the biennial Peace Convergence which challenges the Talisman Sabre war exercises in order to highlight the cost of war and the Australian-US military alliance to Australians, in particular the U.S. / Australian / Japanese joint exercises ‘waving swords’ at China amidst rising tensions. “I am a concerned Australian citizen who doesn’t want my taxes to fund war in which so many innocent people are killed with so little accountability,” says Sam. July 16th 10.00amPeace activist resorted to nonviolent trespass on Talisman Sabre training area after submission to Defence White Paper, personally supported by Malcolm Fraser, was ignored. Yesterday, Nick Deane – the cat in the hat – was charged with trespass and released from Court with a $500 fine. “I wrote a submission in 2014 or the Defence White Paper 2015 on the risks of Australia’s military alliance with America.” Nick said. The submission draws on the late Rt Hon. Malcolm Fraser’s AC CH book ‘Dangerous Allies’ published July 2014. Malcolm Fraser supported the submission by writing a forward for its publication as a pamplet by Nick Deane, leader of the Marrickville Peace Group in Sydney. See Quote from Malcolm Fraser below.”The alliance puts Australians in danger of engaging in America’s war at a great cost to Australians.” said Nick. ‘Cat in the Hat’ peace activist Nick Deane, along with Shane Anderson of Melbourne entered the Shoalwater Bay Military Training area to play a peaceful game of ‘hide and seek’ with soldiers at Talisman Sabre exercises. They were arrested yesterday. “The logical argument I made against the alliance with America in the submission was ignored. I have gone through official channels to object to Australia engaging in U.S. wars, so I have restored to nonviolent civil disobedience to send my message against our alliance with the U.S.A.” said Nick Deane. The sitting magistrate refused Nick’s request to not have a recorded conviction due no prior convictions. The magistrate ordered possessions of Nick Deane confiscated for destruction by the Crown, including a sleeping bag used by Nick Deane’s uncle at the Dunkirk evacuation during World War 2. Confiscation measures and bail conditions imposed by the Rockhampton Court are seen by Peace Convergence Rockhampton – the group all peace activists are part of – as overly harsh on freedom of association rights and punitive in intent. Quote from Malcolm Fraser’s writing in Marrickville Peace Group’s pamplet. Sixth group of Peace Pilgrims face trespass charges today. “Peace Pilgrims” Sam Quinlan, AJ Van Tonder and Teigan Evans will face trespass charges in court today. The group is part of the biennial Peace Convergence which challenges the Talisman Sabre war exercises to highlight the cost of war and the Australian-US military alliance to Australians, in particular the U.S. / Australian / Japanese joint exercises ‘waving swords’ at China amidst rising tensions. “I am a concerned Australian citizen who doesn’t want my taxes to fund war in which so many innocent people are killed with so little accountability,” says Sam Quinlan, one of the pilgrims who trespassed in the Shoalwater Bay training area. In Shoalwater Bay the three men found piles of rubbish, pictured below which gives evidence that the military presence in the traditional Darumbal land is not as conservationist and respectful as the ADF profess. VLAD-like freedom of association restrictions now being extended to peace activists. Faith-based peace activists being arrested for trespass onto Talisman Sabre military training area are receiving harsh bail conditions that prevent them from associating with people from their community, with whom they share accommodation and transport. Jim Dowling declined to enter a plea before a magistrate and remains in Rockhampton Police cells because bail conditions for his release are unreasonable and punitive in intent. Jim is one of a number ‘peace pilgrims’ protesting the Australian-US military alliance due to the number of destructive and drawn out wars into which it has pulled Australians into. Magistrate Michael O’Driscoll ruled the forfeiture of Mr. Dowlings’ camping equipment, including his sleeping bag, which Dowling was counting on using for the remainder of his time in Rockhampton. The bail conditions were such that Mr. Dowling would not be allowed to associate with a number of people with whom he has long-standing personal relationships including friends and people he was staying with in Rockhampton. This, along with the forfeiture of his sleeping gear would leave Dowling with nowhere to sleep for the night. Dowling intends to remain in lock-up until more reasonable bail conditions can be negotiated. Andy Paine, who was arrested along with Jim after their pilgrimage, adjourned his case in the Magistrate’s Court, accepting the bail conditions by default. As a result, he is no longer free to associate with some of his friends or return to the place he was staying. Peace Convergence consider the harsh bail conditions to be an overreach of the court’s powers. “Bail conditions are supposed to limit harms, not political and civil liberties,” says Margaret Pestorius, one of the Convergence organisers. “Freedom of political association along with freedom of communication are basic concepts enshrined in common law. They are the basis for democracy,” Ms Pestorius said. As Jim said about the matter himself, “this is punishment, not bail conditions”. Peace activist resorted to nonviolent trespass on Talisman Sabre training area after submission to Defence White Paper 2015, personally supported by Malcolm Fraser, was ignored. Today, Nick Deane – the cat in the hat – was charged with trespass and released from Court with a $500 fine. Malcolm Fraser supported the submission by writing a forward for its publication as a pamplet by Nick Deane, leader of the Marrickville Peace Group in Sydney. See Quote from Malcolm Fraser below. “The alliance puts Australians in danger of engaging in America’s war at a great cost to Australians.” said Nick. Quaker Grannies arrested yesterday for blockading a military training area gate appeared before a magistrate this morning after refusing bail and spending a night in the Rockhampton Police cells. Yesterday the Grannies were arrested and detained by police after holding a tea party complete with flowers, tea and cake to create dialogue with soldiers participating in the joint U.S / Australia / Japan /NZ Talisman Sabre war exercises. When asked to move by the police they politely stated their intention to stay. Eventually police reluctantly and politely arrested the grandmothers and moved them to the police van. Each of the Grannies were fined $500, conviction not recorded. The Grannies spent time ‘in negotiation’ with the soldiers–“negotiation is not currently part of the war rehearsals, so we are drawing attention to this missing element. It essential to achieve peace” said Quaker Helen Bayes. Outside court “The Quakers have a 335 year history of exercising democratic rights to create peace through dialogue.”, Helen said. When asked about why they chose to break the law, Helen said “the democratic rights we have today are the result of the work of people of conscience pushing back from generations”. Quakers ‘build trust and healing to stop war sowing the seeds of the next war. Peace can only be created through peaceful methods, not bombing and killing and making the other lose”. Margaret Pestorius and Paul Christie also appeared in court this morning facing trespass. They had been walking though the area for a couple of days as part of their “Peace Pilgrimage” before they were picked up by soldiers. Paul received a fine of $500, conviction not recorded. Margaret’s conviction was recorded given her prior history of civil disobedience, with a fine of $750. “Catholicism has a strong history of opposing injustice…Jesus was of course the greatest law breaker of all” said Margaret. The Quaker Grannies and other faith-based groups of activists have converged in Rockhampton to send a message of peace and highlight the costs of the U.S / Australia military alliance and the Talisman Sabre exercise for its military posturing in the face of rising tensions with China. Quaker Grannies Dawn Joyce, Jo Valentine and Helen Bayes blockading a live military training exercise with morning tea. The group is part of the biennial Peace Convergence which protests the Talisman Sabre to highlight the cost of Australian-US alliance and war, in particular that the U.S. / Australian / Japanese joint war exercises are military posturing amidst rising tensions with China. “I am a concerned Australian citizen who doesn’t want my taxes to fund war in which so many innocent people are killed with so little accountability.” says Sam Quinlan, one of the pilgrims now in Shoalwater Bay. Activists aim not only to disrupt the exercises but to engage with soldiers and the military to send a message of Peace. Three Quaker Grannies were arrested yesterday for setting up a ‘tea table’ blockade in front of one of the gates to the training area in order to have dialogue with the soldiers about peace. Senator Scott Ludlam has spoken out in support of the activists. “Most people join the ADF expecting that they’re there for the defence of Australian territory…that’s not what they are training for – it’s about landing on beaches and invading other people’s countries…I don’t think we should be preparing for a war with China.” said Senator Ludlam. Three Quaker Grannies and two Peace Pilgrims including Margaret Pestorius will appear before the Rockhampton court this morning facing charges, including trespass. A group of Quaker Grannies are currently in the Rockhampton police watchouse after being arrested for blockading an entry to Shoalwater bay with a ‘tea and cake negotiation table’. Their intention is to refuse bail because of harsh bail conditions and thus will spend the night in the watch house. The Grannies, who are wearing 160 year-old Quaker bonnets set a table complete with flowers, tea and biscuits in front of the gate to share with soldiers as an invitation to engage in peaceful negotiation. Quaker Helen Bayes says “Negotiation is not currently part of the war rehearsals, so we are drawing attention to this missing element. It is essential to achieve peace. “The ‘Quaker Grannies for Peace’ have 14 grandchildren between them and deeply care about the future of Australia and our region. The federal government should be working towards constructive and responsible international partnership, rather than participating in incendiary military exercises,” Senator Scott Ludlam, Australian Greens acting leader said today. Four groups of peace activists who identify as ‘peace pilgrims’ protested the war exercises today. One other group of Peace Pilgrims were found after two days trespassing in the live training area and are in police custody and being transported back to Rockhampton. Two other groups of pilgrims are still at large. The war rehearsals have been critiqued by experts in International Relations for military posturing in the face of increasing tensions and Peace Convergence is standing against the high costs of war and ‘sword waving’ at China that is the joint U.S./Australian / Japan / NZ Talisman Sabre war exercises. Quaker Grannies for Peace invite soldiers to tea and cake in blockade. As part of Peace Convergence 2015 ‘Quaker Grannies for Peace’ have set up a tea table blockading the access road to Samuel Hill military base being used for the Talisman Sabre military exercises. “Our Quaker peace testimony from 1661 says ‘We utterly deny all outward wars and strife and fighting with outward weapons for any end or under any pretence whatsoever.” said the Grannies. They have set up a table and chairs and prepared tea and cake in order to engage in dialogue with military personnel. ‘We are asking the soldiers, ‘How do you think the Chinese view these war rehearsals? Do you think it is helping our relationship with our biggest trading partner?’ said another Granny. Professor Richard Tanter from the Nautilus Institute has said the increased militarisation that the US-Australian military alliance brings, “these policy and force structure changes may well be, from a Chinese perspective, that Australia is not so much hosting US military bases, but is becoming a virtual American base in its own right”. There are now over eight activists in the Talisman Sabre live training area in Shoalwater Bay QLD. Activists are engaged in actions to slow down and disrupt the joint U.S/Australian/Japan/NZ war exercises in protest of the high human and economic costs of war, the militarisation of our region and aggressive sword waving toward China. “These Talisman Sabre exercises represent preparations for war – not peacemaking – in a climate of aggressive posturing: the US versus China in this case” said Margaret Pestorius, one of the activists in the training area said. Range Control at the training area and local police have been notified by Peace Convergence. BREAKING: Two more peace activists have entered the live training area at Talisman Sabre to play a game of hide and seek. Invitations were mailed to General Smith two weeks ago to his Canberra address to watch out for the cat in the hat at Talisman Sabre military exercises. By inviting General Smith to play hide-and-seek, the Cat in the Hat hopes to demonstrate that a serious message can be put across through good humour. A peaceful game of hide-and-seek aims to disrupt the military’s ‘main game’ of war practice. “The war rehearsals of Talisman Sabre send China a clear message. Australia is declaring itself to be a part of the US war machine. This means that Talisman Sabre brings war closer, thereby making every Australian less secure,” the cat said. “If, through making a fool of myself, I manage to make anyone think about and question the true nature and value of the Australian/US alliance, it has been worth the effort,” the cat said. Peace activist Margaret Pestorius and a companion are currently on a pilgrimage through the Talisman Sabre training area. The two entered the training area sometime this morning. Range control has been notified that civilians are in the training area and a cease of any live fire has been requested for their safety. Margaret is the widow of the late Bryan Law, a peace activist who damaged a Tiger attack helicopter with a mattock at 2011 Talisman Sabre military exercises. This is the second pilgrimage into the live training area by Christian activists undertaken for Peace Convergence 2015, a biennial gathering against the Talisman Sabre military exercises at Shoalwater bay. “Peace pilgrimages are a complex action involving physically getting in the way of the war preparations at Talisman Sabre” Margaret said. “I’m not happy about my country becoming more and more part of the U.S and their military activity.” Margaret said. Three Christian ‘Peace Pilgrims’ appeared at the Rockhampton Court this morning after they were found and arrested yesterday in the Shoalwater Bay Training Area. Talisman Sabre has been marketing itself in the media as glamorous and necessary war exercises. 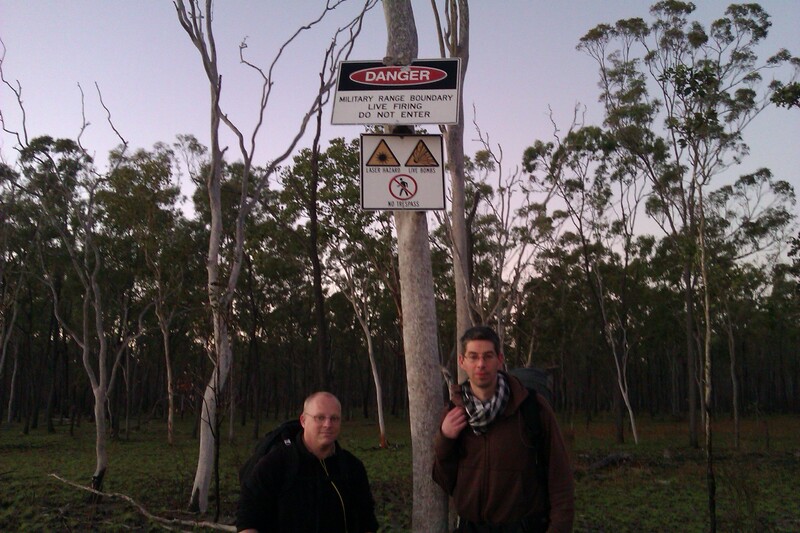 Early yesterday morning, Pastor Simon Reeves, Reverend Simon Moyle and Quaker Greg Rolles made a faith-based pilgrimage as part of Peace Convergence 2015 – into Talisman Sabre training area to highlight and disrupt US, New Zealand, and Japanese troops practicing invasion and war. They aimed to encounter, pray and share communion with soldiers. They were arrested and detained by military police yesterday and handed over to local police. The three refused bail and pleaded guilty to charges of trespass on commonwealth land. Rolles was also charged with taking photos in a prohibited area, and Moyle with obstructing the duty of police. Collectively the group incurred fines of $2000. The magistrate raised questions about the risk of personal harm involved in trespassing during the war rehearsals. “As soldiers are willing to put their bodies on the line, I’m willing to put my body on the line for peace,” responded Rolles. The charge sheets stated that the men had disrupted Talisman Sabre. “None of us actually want the death and destruction we’ve seen in the last fourteen years so we actually have a lot in common.” Reverend Moyle said. Former army recruit Rolles, who has a Masters Degree in International Relations said “Talisman Sabre is designed to incorporate Australian troops into the US army. Three peace activist ‘pilgrims’, Simon Moyle, Greg Rolles and Simon Reeves arrested for entering Talisman Sabre yesterday, refused bail conditions yesterday will appear at Rockhampton Court this morning. Local police have advised the three men will appear this morning to face trespass charges and will enter a plea. The Rockhampton Peace Convergence, of which the pilgrims are a part, will hold a procession, beginning at Havachat, 20 East St, Rockhampton to the Court House Â in support of the three men. The procession will begin at at 930am at 20 East St and will get to the Court House at approximately 940am. A press conference will be held at 12pm outside the Court House where the three men will be available for press interviews after their appearance in court. Christian pilgrims Greg Rolles, Simon Reeves and Simon Moyle entered the Talisman Sabre training area early this morning to disrupt proceedings and to encounter soldiers to share communion and prayer with them. The pilgrimages are being made as part of Peace Convergence Rockhampton 2015, a biennial nonviolent protest against Talisman Sabre and the high human, economic and environmental costs of war. At around 4pm Peace Convergence was notified that the pilgrims had been removed and arrested, and are being held at Rockhampton watch house for processing. The three peace activists will soon make a decision to sign bail conditions or not, and will appear in the Rockhampton court tomorrow morning. Before dawn this morning, three Christian peace pilgrims entered Shoalwater Bay live training area to disrupt the ‘Talisman Sabre’ US-Australian war ‘rehearsals’ as ‘invaders’ are parachuted in to begin the ‘games’. Guns and missiles are being fired in the training area. Armed reconnaissance helicopters, armoured tanks possibly lined with depleted uranium, black hawks, guided missiles, US navy surface vessels, and nuclear weapons capable submarines are potentially being used, according to the Talisman Sabre 2015 Public Environment Report. Range Control for Talisman Sabre have been notified that civilians are present in the training zone and were asked to call a ceasefire. Peace Convergence have been told by Range Control that the concern would be ‘passed on’, and are still awaiting a response. The activists entered the training area in objection to the Australian-US military alliance, and to the human, economic and environmental costs of those wars into which Australian soldiers and the Australian taxpaying public have been drawn. Pilgrims bear witness to and represent the very real threat to civilians in war. The three pilgrims, pastor Simon Reeves, Quaker Greg Rolles and the Reverend Simon Moyle, made the following joint statement before entering the training area. “As Australians with the question, ‘have these wars been worth the cost?’ We are walking into Shoalwater Bay in the midst of exercise Talisman Sabre in the hope of finding a less destructive way of dealing with conflict. All these lives lost, all this money spent and the world is a more dangerous place since 2001. Bodies of soldiers have been broken, minds and souls damaged. The blood of countless lives has been shed. Is this what we want? Is this the kind of country we want to be? When we meet soldiers on the base we will be inviting them to share the Eucharist, remembering bodies broken and blood shed, in the hope of finding a better way forward together. “I am also walking because 200 years ago, Shoalwater Bay belonged to the Indigenous Peoples of the area. It’s one of Australia’s first war sites, with European settlers attempting to kill off or remove the Darumbal People. I will pilgrimage into Shoalwater Bay to remember those First Peoples who lost their lives and culture on this land,” said Greg. Since 2005 Peace Pilgrims have created a legacy of walking on to the Shoalwater Bay training area during the Talisman Sabre exercises – sometimes for days at a time – to call a ceasefire. For the pilgrims, who have travelled from around Australia to participate, the protest is an outwork of peace that is rooted in their Christian and other faith traditions. An interfaith commitment to the principle of nonviolence in the tradition of Jesus, Gandhi, The Buddha, Martin Luther King, and Desmond Tutu is shared and practiced by all activists. “A pilgrimage is a sacred journey to a significant place’, says Margaret Pestorius, a pioneer of the peace pilgrim actions. ‘Our pilgrimage is a journey to the traditional lands of the Darumbal people where the military is rehearsing for war and testing weapons. Here we are exercising the values of our faith for the preservation of life and against the costs of war”. This year’s Talisman Sabre biennial combined war exercises will be the biggest of military exercise of its kind in Australia’s history. It will span across multiple locations in Australia and involve US, New Zealand and Japanese defense personnel. It will cost Australians fifteen to twenty million dollars. The Shoalwater Bay Training Area comprises of 454,500 hectares of Marine and terrestrial areas, with a range of riverine plains, sand and mud flats, swamps, dunes, estuarine inlets, coastal cliffs and mountains. It also encompases part of the Great Barrier Reef World Heritage Area and contains a number of rare and endangered species. The land is also of historical and cultural significance to the local Darumbal people, who retain only limited access to the land. As Talisman Sabre begins its military activity in the region, people at Peace Convergence took the opportunity to re-brand Rockhampton’s iconic beef country bull statues. In a playful gesture, Rockhampton’s bulls were decorated with peace signs and messages. Rockhampton could now be Australia’s peace-a-bull capital instead of a military training area. Rockhampton, the major centre that services the military exercise, is the beef capital of Australia. Large concrete bulls dot the town and are visible on its major thoroughfares. Peace Convergence stands against the human, environmental, social justice costs and high “steaks” political ramifications of conducting these large-scale military exercises in our region. Talisman Sabre is a strategic part of a ‘bull-headed’ and destructive war machine, which supports US led military operations further afield. Furthermore, the purported benefits of Talisman Sabre to the local community are “bull”. The Australian government spends $70 million a day on its military. The so called economic benefit to the Rockhampton is a mere fraction of that. According to the Talisman Sabre 2015 Public Environment Report (p 30) “the ADF spent “over AUD 4 million [on local goods and service] in the Rockhampton area. Peace activist Robin Taubenfeld said ”stopping the war games and diverting military spending to the local economy would be of greater benefit; and without the costs and pollution of war making, of which Talisman Sabre is a part”. Peace Convergence calls on the local community, and people around Australia “to grab the bull by the horns and reject the US military alliance as it stands. As a key ally, Australia can help “steer” the US down a Peace-a-bull path”, said Robin. Professor Kozue Akibayashi from Kyoto will be visiting Rockhampton to speak about the hidden impacts of hosting U.S military bases on the island of Okinawa, as part of the Peace Convergence being held during Exercise Talisman Sabre. Professor Akibayashi is the International President of the Women’s International League for Peace and Freedom (WILPF). Active in Europe since World War I, WILPF is this year celebrating its centenary. Professor Akibayashi lectures in gender, peace and militarism at Doshisha University. She asserts that the U.S. military has been granted what amounts to diplomatic immunity for whatever they do in Japan, including sexual violence. Her research has revealed perpetrators are not punished and the victims rarely acknowledged. Professor Akibayashi will be speaking at the Fitzroy Room in the Rockhampton Regional library at 5pm on Saturday, 11 July. At the same event, awarded Australian filmmaker David Bradbury will be premiering his documentary War on Trial, about the events surrounding the late Bryan Law’s disabling of an army helicopter during Talisman Sabre 2011 and the trial of another Peace Pilgrim, Graeme Dunstan. Entry is by donation. Inquiries 0458 298 297 Bookings 07 4914 0087. Australian filmmaker David Bradbury is premiering his latest documentary War on Trial in Rockhampton next Saturday night, July 11 at 7pm in the Library’s Fitzroy Room. The event is part of this year’s Rockhampton Peace Convergence which gathers in response to the Talisman Sabre war rehearsals. Mr Bradbury has won many Australian and international film festival awards, including five Australian Film Industry prizes and two Oscar nominations. “It tells the story of the trial of Graeme Dunstan, his relationship with the late Bryan Law, and how together they disabled an Australian military helicopter during the 2011 Talisman Sabre exercise. The film questions the basic nature of the Australian-US military alliance and why we go to war. “In today’s conservative political climate, where the media is often self censoring, to challenge our armed forces being embedded with the American military is regarded as unpatriotic. To question the notion that Australian forces should NOT invade Middle Eastern countries because there is no direct threat to Australia, just like the disaster that was Gallipoli, is seen as a green flag to ‘Terrorism’.” says Bradbury. “Our politicians and military commanders have learnt little after 100 years of defining our nation through war” Bradbury says. “Is it really making us safer here in Australia?” asks Bradbury. “The international arms manufacturers are the only ones to gain. They laugh all the way to their hidden Swiss bank accounts on the back of the poor Australian taxpayer and the traumatised war dead of the countries we invade. That is not the Australian way, the Anzac way,” the twice Oscar nominated war cameraman and foreign correspondent Bradbury says. At the premiere, Japanese academic and renowned peace activist, Professor Kozue Akibayashi will be speaking about the hidden social and environmental costs the people of Okinawa have paid for hosting U.S. military bases on their small island. Entry fee for both is $5 at the door. Shoalwater: Up for Grabs (1994) with then Midnight Oil lead singer-turned senator Peter Garrett about shifty white-shoe brigade businessmen’s’ proposal to sand-mine in Shoalwater Bay to produce white paint from the mineral sands of the ancient coastal dunes. Within three weeks of the documentary airing on Channel Seven, the Government moved to protect the area. Blowin’ in the Wind (2007) examines Australia’s secret treaty with the US, which allows their military to train and test their weapons on Australian soil and water. ‘Blowin’ questions whether ‘depleted’ uranium has ever been used in the military training area by the US military in the light of our own experience in Woomera and Maralinga atomic bomb sites and overseas. Depleted uranium causes birth defects. The US military denied its use in Okinawa and Puerto Rico training grounds but later evidence concluded they lied. 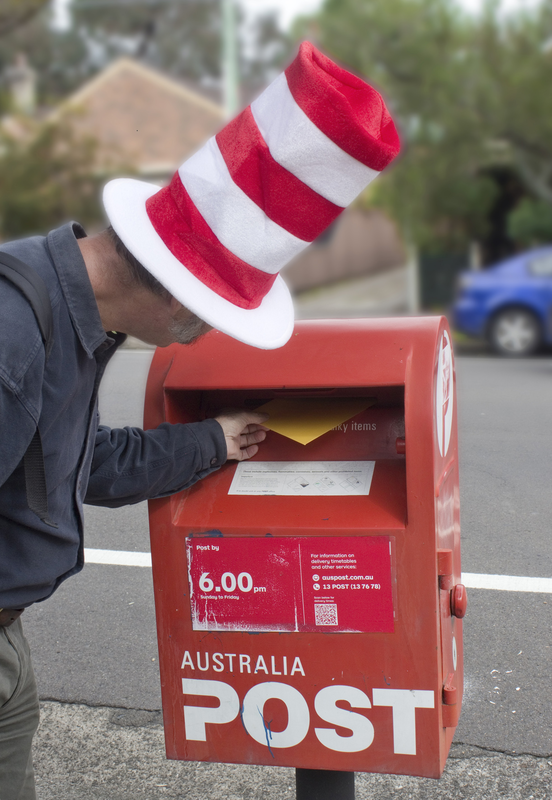 Today, Major General Stuart Smith, commanding officer of the Australian forces at Talisman Sabre military exercises, is receiving up to fifty invitations in the ‘slow’ mail in Canberra to seek a ‘cat in a hat’ hiding at Talisman Sabre. The invitation advises the general to ‘watch out for the Cat in the Hat’ and includes a picture of the hat worn by the famous Dr Seuss character. The invitation was written ‘in the spirit of civil disobedience’ and playful disruption to the Talisman Sabre war ‘rehearsals’. Provocateurs for Peace are from all over the country and have sent numerous copies to make sure that the major general ‘gets the message’. He is invited to play a game of hide and seek for peace, not war games. Innocently and playfully challenging and countering the war narrative. The group has also released a photograph of an unidentified person wearing the hat, placing mail in a mailbox ‘somewhere in Australia’. The Shoalwater Bay Training Area comprises of 454,500 hectares of Marine and terrestrial areas, with a range of riverine plains, sand and mud flats, swamps, dunes, estuarine inlets, coastal cliffs and mountains. It also encompases part of the Great Barrier Reef World Heritage Area and contains a number of rare and endangered species. The land is also of historical and cultural significance to the local Darrambal people, who retain only limited access to the land. This year’s Talisman Sabre will be the biggest of military exercise of its kind in Australia’s history. It will span across multiple locations in Australia and involve US, New Zealand and Japanese defense personnel. Peace activists will be handing out peace balloons to children and their families at the Talisman Sabre open day tomorrow at the Rockhampton Showgrounds. As Talisman Sabre is about to start, the military and the Rockhampton City Council host an Open Day to show off Aussie and US weaponry and the latest in warfare and surveillance technology. Children are invited to climb on armed vehicles, play with guns and pose as military personnel with a backdrop of the pomp and parade of military bands and other entertainment. Promoted as “family friendly”, the Open Day is a military PR exercise which invites children to feel comfortable around weapons of destruction, while failing to explain the real purpose of the machinery and the real costs of war. This year the group plan to hand balloons out at the NAIDOC day celebrations in Rockhampton on the 10th and the Yeppoon Peace Parade on the 12th. Anyone from around Australia can assist the group by sponsoring Balloons via the group’s Pozible campaign. Faith-based peace advocates from around the country are converging in Rockhampton, Queensland to participate in what has become a tradition of protesting during US-Australian military training exercises. Since the first Biennial Talisman Sabre war ‘rehearsals’ 10 years ago in Shoalwater Bay outside of Rockhampton, peace activists have met the military presence with their own non-violent efforts to protest the Australian-US military alliance and the global human, economic and environmental costs of war. “A pilgrimage is a sacred journey to a significant place’, says Peace Pilgrim Margaret. ‘Our pilgrimage is a journey to the traditional lands of the Darrambal people where the military is rehearsing war and testing weapons. Here we are exercising the values of our faith for the preservation of life and against the costs of war”. Since 2005 Peace Pilgrims have created a legacy of walking on to the training area–sometimes for days at a time–to call a ceasefire for the practicing troops. This year’s military exercise will be the biggest in Australia’s history and it is also expected that there will be more pilgrims than ever to participate. “We Quakers have a 350 year old tradition of resisting war, refusing to profit from war, and working for peace and reconciliation”. The ‘Quaker Grannies’ will be joined by other groups from various Christian and other traditions for whom the protest is an outwork of their faith and belief in peace. An interfaith commitment to the principle of nonviolence in the tradition of Jesus, Gandhi, The Buddha, Martin Luther King, and Desmond Tutu is shared and practiced by all activists. Peace Pilgrims plan to hold faith-based journeys to disrupt Talisman Sabre 2015 over the next two weeks. This year’s Talisman Sabre will be the biggest of military exercise of its kind in Australia’s history. It will span across multiple locations in Australia and involve US, New Zealand and Japanese defence personnel. 11 am Saturday 4 July 2015 at the gates of Western Street Barracks,Western Street, Rockhampton. “Consider it a pre-emptive strike for peace,” said SpeakOut host, veteran peace activist Graeme Dunstan of Peacebus.com. “Far from bringing Australia security, the US alliance threatens our security by making enemies out of trading partners and engaging us in foreign wars in which no national interest is at stake. “US Asian Pivot for example, which has stationed US Marines in Darwin and maybe a USAF B2 bomber base too, is aimed at “containing” China, our largest trading partner,” he said. The SpeakOut will mark the official start of the Shoalwater Peace Convergence, with people coming from all over Australia to Rockhampton to protest and non-violently disrupt the Talisman Sabre military exercises. Peace Convergence 2015 will be the sixth gathering of peace activists from all over Australia, converging on the Talisman Sabre ‘war rehearsals’ at Shoalwater Bay, a coastal wilderness area at the southern end of our world heritage Great Barrier Reef. Graeme Dunstan, ‘captain’ of the Peacebus has arrived in Rockhampton to prepare for his fifth Peace Convergence. Along with the late Bryan Law, Graeme was arrested for disabling a new Australian Army Tiger Attack helicopter during the Talisman Sabre 2011. ‘This will be my fifth Talisman Sabre season so I have a lot of friends in Rockhampton. There are lots of people in Rocky who are unhappy about the endless wars which the US alliance has led us into.’ Graeme said. Graeme describes Peace Convergence as a celebration of peace and war resistance. It’s program will include speakouts, debates, concerts, parades, protests, blockades and ‘Peace Pilgrim’ intrusions onto the Shoalwater Exercise Area, all aimed at disrupting the ‘war rehearsals’ and creating counter narratives to highlight the cost of the U.S. – Australia military alliance. First up Graeme is painting a new mural for his Peacebus. It’s message is strong: ‘No more U.S. wars’. The mural is being painted at Havachat, a community drop in centre and arts workshop at 20 East Street, Rockhampton. Havachat will the organising base for Peace Convergence HQ. “We are making banners, placards, lanterns, a couple of backpack puppets for street theatre and generally organising events for the peace convergence. People are imvited to drop by, say hello and have a chat about what we are doing and how they feel about the wars,’ Graeme said. While the Abbott government continues to cut money from education, health and other services, it is ramping up its spend on war and terrorism and encouraging local politicians such as the Member for Capricornia, Michelle Landry to spruik the economic benefits of 30,000 US, Australian, New Zealand and Japanese troops coming to the region for the biennial Talisman Sabre exercises. Peace Convergence, a coalition of groups who oppose war for many reasons, argue that militarisation presents a false economy blindly accepted by tax payers and should be heavily scrutinised. “Australian tax payers foot the bill for our defence, but few are aware that we have a policy to largely outsource military logistics. Essentially, we are paying for private contractors to get rich,” says Graeme Dunstan for Peace Bus, a member of the Peace Convergence Coalition. The bulk of the Talisman Sabre exercises are being held in Shoalwater Bay. Local Member Michelle Landy is an advocate for militarising the Capricorn Coast. “For Michelle Landry, the bells of cash registers ring as Australian’s and American’s practise war in her electorate,” says Graeme Dunstan. “The Peace Convergence asks what will aiding and abetting militarism bring to the community? Is the temporary job creation as virtuous as it sounds? “We know from the Okinawans that along with greater military presence comes more violent crime and more subtly, an increasing military presence militarises local culture. It was also learned that militarising the process of policing made deceit and secrecy in government the norm,” says Dunstan. It was revealed in 2011 that Mayor Brad Carter and his CEO had engaged in secret negotiations to obtain a permanent U.S. military base established in the Rockhampton Region. “The secrecy and deceit aspect of militarism’s baleful influences in the local area should already be known to Ms Landry, yet she advocates for more military presence,” says Dunstan. “We challenge Ms Landry to defend in public debate the morality and efficacy of promoting militarism in the lead up to the Talisman Sabre exercise and encourage everyone to scrutinise the true cost of war rehearsing for Australia,” concludes Dunstan.